Holding 240 yards of 40 lb Samurai braid—and with a 22 pound drag max, new Lexa 300 sized reels are built for strong lines and big fish. 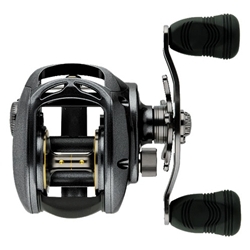 Salmon, Muskie, Striper, Steelhead, and most flats and saltwater inshore tasks, Lexa 300 sized reels handle it all with a full choice of high power and high speed retrieve ratios. Bass to Walleye, Redfish and Trout, 100 sized reels are perfect for most freshwater and light saltwater applications.